If you've had other varieties of Just Bunches! cereal, this new cereal will taste almost exactly as you imagine it would. It's Cinnamon Just Bunch! No surprises. It's the cereal you know and, likely, love with a pleasing cinnamon flavor. If you're unfamiliar with the Just Bunches! 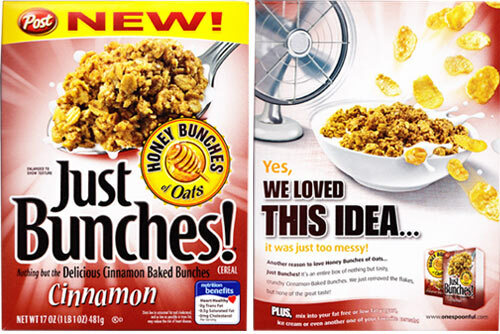 concept... Post makes a popular cereal called Honey Bunches of Oats. It's comprised of flakes and crunchy oat clusters called "bunches". Just Bunches! cereal is (simply stated) Honey Bunches Of Oats with the flakes removed. I'm a Just Bunches! fan. I like the Honey Roasted variety (still made) and I enjoyed the short-lived Caramel variety. I also love cinnamon. A subtitle on the cereal box says, "Nothing but the Delicious Cinnamon Baked Bunches." It's the word "baked" that gives this cereal's flavor a certain special quality. Unlike some other cereals, where a cinnamon-sugar mixture is dusted over the pieces, this cereal really does have a baked-in cinnamon flavor. The texture of Cinnamon Just Bunches! is similar to many other granola-style cereals, but the flavor is more reminiscent of a cinnamon muffin or a cinnamon waffle. It's a great flavor and it works great in this cereal. For fans of crunch, I should note that this cereal stayed moderately crunchy in milk for the entire 12 minutes it took me to eat a bowl and write this review. Overall, I really liked Cinnamon Just Bunches! It's like a dear old friend in a really cool, yet stylishly conservative new suit... a cinnamon friend that I will eat again. Nutritional Concerns: Each 2/3 cup serving has 250 calories, 7 grams of total fat (0.5 grams saturated and 0 grams trans), 0 mg cholesterol, 75 mg sodium, 42 grams of total carbs, 4 grams of dietary fiber, 14 grams of sugars and 5 grams of protein. What do you think of Cinnamon Just Bunches!? I want this one to come back! Still looking for Cinnamon Just Bunches. Can't find it. Going through cereal withdrawals. I also love this cereal. I also lost them at Shop-Rite which is my store of choice. When they disappeared there I checked all grocery stores in the immediate area. All varieties of Bunches just disappeared. I had been a fan of Grape Nuts for a million years, but these are even better. Much better. Eventually I did a Google search and lo and behold... Amazon was selling them. At a great discount; so I signed up for a monthly delivery. That lasted for about 4 months. Then they were gone. I just found a plain Honey variety... it is nice but not like the cinnamon! The larger variety Honey Bunches of Oats with a dozen flavors includes cinnamon, they are not even close although this is the cereal that created Just Bunches! 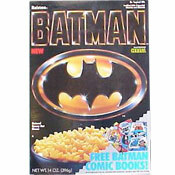 I loved, Loved, LOVED this cereal! Where did it go? I need some! I am too missing the bunches... where have they gone? I think certain Stop n Shops carry them but I'm not sure. I bought this cereal at Shaws. Shaws went out of business. Stop and Shop carried Just bunches for a while. They discontinued it so I bought the last 4 boxed at the discontinued price. 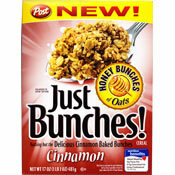 I found Just Bunches at Shop-Rite and thought this was where I would have to pick up my cereal.I have been checking at the 3 area Shop-Rites in my area and the shelves have not been stocked with any Just Bunches. Now I cant find them anywhere! Where can I find the Cinnamon Just Bunches!! Help! !